Our ABS Lanyard - Y-connector model has been tested in accordance with EN 354:2010 and is equipped with a sharp edge-tested kernmantle cable and an integrated energy absorber (acc. to EN 355:2002). The device includes a carabiner hook and 2 pipe hooks. Length: 2 m. Total weight: 1.75 kg. Where large areas have been equipped with single anchorage points or non-traversable lifeline systems, the users often face the same problem: The carabiner of the lanyard (cable between the user and the safety system) has to be unhooked and hooked back up when switching from one anchorage point to the next - or when going past intermediate posts or corner elements in a lifeline system. Not only is this in violation of the fall protection regulations, it can also be lethal. Should the user slip just at that particular moment in time, he/she may suffer a dangerous fall off or through the structure. Avoid this risk by using an ABS Lanyard - Y-connector. This dual band lanyard (tested in accordance with EN 354) does not simply offer 1 cable with an attached carabiner hook for hooking up to the respective anchorage system - but instead 2 large pipe hooks that can be moved on one after the other. This means that the user remains safely secured even when re-attaching one of the hooks - prepared at all times for a wrong step or accidental slip. 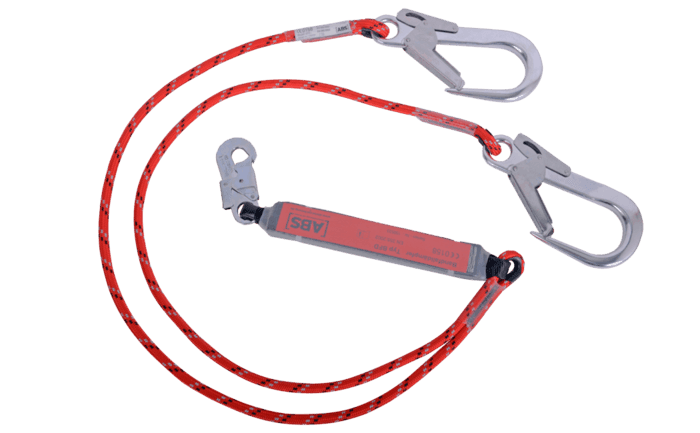 Our ABS Lanyard - Y-connector is also equipped with a high-quality energy absorber (tested in accordance with EN 355) that considerably reduces the force exerted on the user's body in the case of a fall. At the heart of our ABS Lanyard - Y-connector model is a robust, red kernmantle cable. This extremely durable cable is 12 mm in diameter - and it goes without saying that we have tested it on sharp edges. The 2 pipe hooks attached to this connector cable let you use it with load-bearing pipes or similar anchorage options. The larger openings can also be used with typical anchors, lifeline systems or cable gliders. Are you not quite sure which lanyard connector is the right one for the purpose you have in mind? Then our experienced Team would be happy to provide you with advice on the most suitable product. Of course, we can also provide you with information on the prescribed annual PPE inspections and on how to correctly store your equipment.